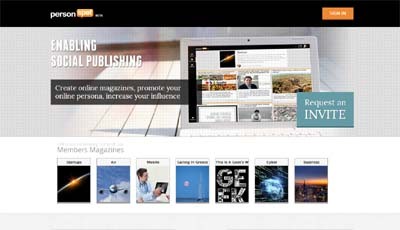 PersonSpot is a social publishing application which allows users to publish online social magazines with content they identify through their social feeds, discover on the Web or create themselves. PersonSpot targets individuals looking to express, promote, define themselves or their business, and ultimately create value for their personal brand by informing others. PersonSpot provides a clean user- and mobile-friendly responsive interface and offers the ability to create multiple magazines based on topics, audiences or designated sharing features. Users can choose which of their magazines are public and which are private, allowing them to socially share some content while managing their personal reading material as well.